This DTC is stored when the blind spot monitor sensor RH detects an open in the blind spot monitor indicator RH. 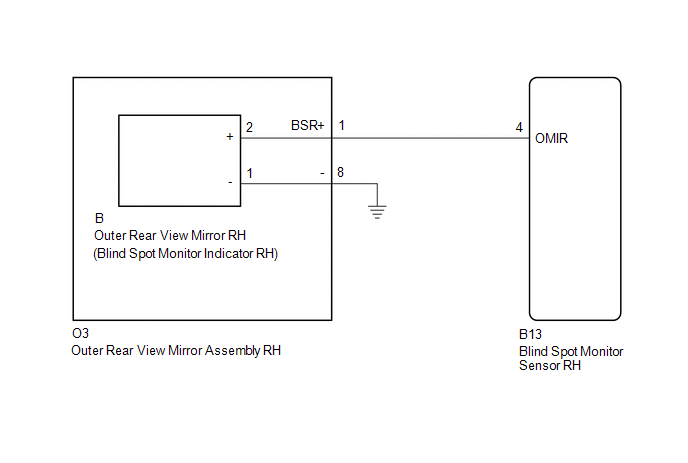 With the blind spot monitor main switch assembly (warning canceling switch assembly) on, the current flowing to the indicator is below a specified value when indicator operation voltage is sent to the indicator. (a) Disconnect the B13 blind spot monitor sensor RH connector. (b) Remove the outer rear view mirror RH (See page ).